Betterment provides portfolio management for investors. What's appealing and different about this firm is its ease of use; accessibility to average investors; relatively low cost; proprietary investment methodology that involves global diversification (plus tax efficiency); and emphasis on goal setting. Investment services offered by Betterment are targeted to 1) the beginner investor with a modest amount of discretionary income available for investing and 2) the more experienced investor who wants to minimize involvement with day-to-day investment decisions. Betterment provides portfolio management services, which may also be called investment, investment advisory, or money management services. A client engages a portfolio management firm to invest on her (or his) behalf: transfer money into an account; provide guidance on preferences, goals, and risk tolerance; and allow the firm to invest your money according to its methodologies. The benefit of portfolio management is to free investors from the tyranny of managing their investments. Deciding on an asset allocation, selecting individual stocks or funds, monitoring their performance, re-balancing a portfolio, and making day-to-day decisions about investments can be time consuming and energy zapping for many people. Portfolio managers serve those who simply want to outsource investment decisions. Like a good financial adviser, Betterment asks its clients to establish financial goals. The amount needed and the time horizons of these goals (whether five years for the purchase of a new car or 25 years for retirement) shape specifics of the investment plan, such as monthly contributions and asset allocation. Based on my experience, Betterment one-ups the typical adviser who asks about financial goals and simply waits for a response. Such one-on-one situations have made me feel awkward: if I have not yet nailed down my retirement plans, then I must be shortsighted; or if I share dreams of traveling the world, then I may be viewed as careless or unrealistic. Fortunately, Betterment suggests goals that seem reasonable (in terms of age, years until retirement, and annual income). For example, Betterment offered the following goals along with suggested dollar amounts to me: safety net; retirement funds (held in both retirement and regular accounts); and general investing. These goals are aligned with my way of thinking: I definitely want to have money saved for emergency purposes, retirement, and anything else that I happen to need or want along the way. I can choose one of the goals that Betterment suggests or create one or more of my own goals. For example, if I want to save for a cruise to Antarctica, then I enter its expected cost and my timeline for saving. Similarly, I may save for a house down payment in five years. Over time, Betterment reports whether I am on track or off track to reach my goals. When I view my account and individual goals, I'll see estimates of my account balances in years to come. These growth projections are based on expected (not guaranteed) returns given both average and poor market performance, and are based largely on historical performance. My money is invested in a diversified global portfolio of ETFs. Assets are allocated among stock and bond ETFs with the intention of achieving highest expected returns at chosen risk levels (considering potential downsides along with volatility) based on the time horizon of each goal. Betterment has recently changed its fee structure. Investment portfolios are charged 0.25% annually of assets under management (AUM) up to $5,000 per year. Clients with more than $2 million in Betterment won't be charged extra AUM fees after the balance reaches this point. For example, if I have a $5,000 balance with Betterment, I'll pay $12.50 annually for this investing service ($5,000 x 0.25% = $12.50). If my balance is $2,000,000, I'll pay $5,000 annually but if I have $3,000,000, I'll still pay $5,000. So, the more money I invest with Betterment over this $2 million mark, the less I'll pay in terms of AUM percentages. There are also extra services available for higher AUM costs. If I hold $100,000 with Betterment and am willing to pay 0.40% AUM, then I can get unlimited phone calls with a team of Certified Financial Planners (CFPs). For example, if I held $1,000,000 with Betterment and wanted to pay $4,000 rather than $2,500 annually, then I could get access to a team of credentialed advisers. This arrangement could be worth the cost if the advice is sound and personalized as planning fees can be expensive. In the past, the company's fees ranged from .15% to .35% of assets under management, depending on the size of my portfolio. The exception to this general rule was the portfolio valued at less than $10,000 without automatic deposits of $100 or more; in this situation, a $3 monthly fee was incurred and assessed on a quarterly basis. Fortunately, this fee has been erased, making Betterment (in terms of comparable fees) more attractive for the small or beginning investor than before. Fees are calculated on average annual balances of my account (my combined goals) and assessed quarterly. Note that an assessment is a subtraction of fees from the portfolio. Through this arrangement, I can more readily see the impact of portfolio charges on my investment returns. Plus, I do not have to offer cash to my investment manager; the money is simply deducted from my account. Other than extra AUM fees for extra planning services, there are no other fees. I'm not charged for opening and maintaining an account. Transaction charges for buying and selling ETFs on my behalf are not passed along to me. Reinvestment of dividends and portfolio re-balancing are also provided at no additional charge. There are several ways that investing with Betterment is tax efficient. Portfolios contain index-tracking ETFs, for example, which helps me avoid taxes associated with pass-through distributions of capital gains, common with actively-managed mutual funds. Reinvested dividends and account deposits go to purchase under-weighted asset classes, minimizing buy-and-sell activity (and tax triggers) for re-balancing. The firm also offers tax loss harvesting, which involves selling any losing ETFs and capturing losses for tax purposes and the purchasing similar ETFs to maintain the asset allocation of a portfolio. This service is available to all Betterment clients at no extra charge. Still, I've noticed that the buying and selling does generate a tax bill as I hold a regular taxable account. If I had invested in a single stock instead of a Betterment portfolio, then I could have avoided taxes (as long as I didn't sell my shares). Getting started with Betterment is simple and easy. From its home page, respond to a series of prompts to get suggested goals, accept or decline those suggestions, and register for an account to start investing toward those goals. I can also register for an account, set goals with specific timelines, or choose to “build wealth” without regard to a time horizon. Money can be held inside a regular (taxable) account, Traditional IRA, Roth IRA, or trust account. To start investing, fund an investment account by transferring money from a bank account. Register a checking or savings account to initiate electronic ACH transfers in the future. After the set-up is complete (which usually takes 2-3 days and involves an account verification process), money is transferred and immediately applied to various goals within the Betterment account. The firm presents a recommended asset allocation (stocks and bonds). Accept the recommendation or make changes to the stock/bond mix along a continuum of conservative to aggressive (and if I go too far in either direction, settings may be deemed “too conservative” and “too aggressive” to meet my goals). There is no minimum deposit required or minimum account balance. From what I can discern, the investment methodology used by Betterment is designed to deliver stable but not stellar returns. For more details, read about how the firm applies the Black-Litterman model to Modern Portfolio Theory in the portfolio section of the website. There are no guarantees that I will earn money with this firm's approach and my account may lose value. 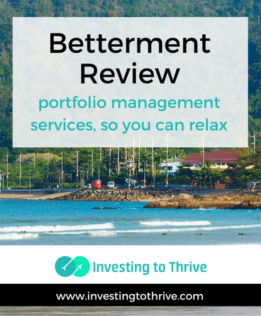 If the concept of a portfolio management service is appealing, then Betterment is reasonably priced. Fees for such services from more traditional providers tend to range from 0.5-2.0% of assets under management, not counting trading fees and fund expenses. Further, a small portfolio (which could be defined as less than $10,000 by some firms or less than $5 million by others) is often not eligible for management. In summary, the firm's services may be well-suited for the hands-off investor who just wants to get started in investing or would like someone else to handle the headaches of investing.